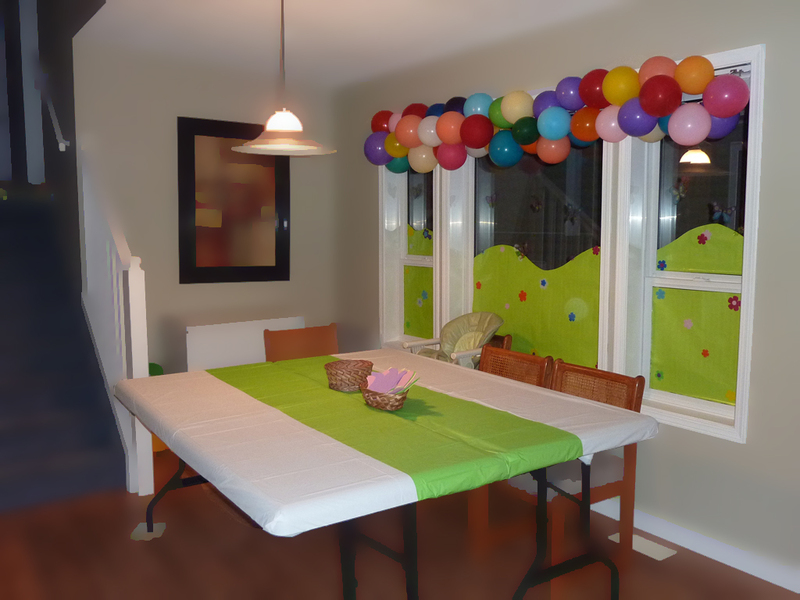 I am a fan of balloons as they are an inexpensive way to decorate and it’s easy to customize with colors. Spring is loaded with colors, so I chose to use an assortment of colors. Caution though, balloons are not safe for children who may bite them and they can cause suffocation, so use with care. The hills on the windows are made from green wrapping paper that I cut and taped with masking tape. What I learned: with the sun shining through the window you could see the masking tape through the paper. I put foam flowers on the hills though and made sure to cover each piece of the masking tape so you couldn’t see it. I got the foam flowers at Michaels. The table is two folding tables put together. Each table is covered with white disposable table clothes found at the dollar store. The green plastic table cloth served two purposes: to cover the seam of the two tables and to be a decorative runner. I like to use masking tape to tape the table cloths down so when the guests (especially the children) sit at the table, they won’t accidentally pull the table cloth off. 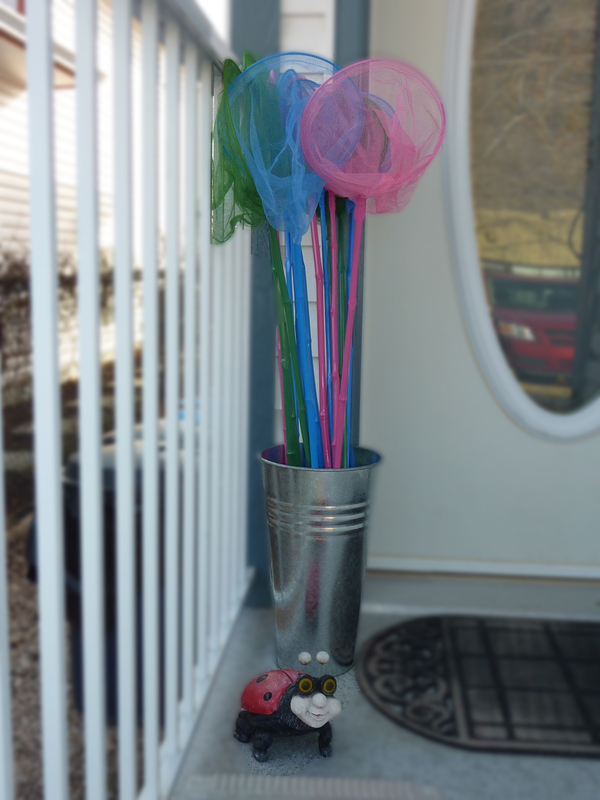 I got the idea for the Heart and Lollipop Flowers from Martha Stewart’s website. It is part of her Valentine’s day crafts. Displayed as flowers would be in a basket, each of the guests got to pick a flower to take home. There was a thank you message written on a leaf for each flower, so this worked twofold: it was a favour to take home and the thank you note. Here is the bonus of knowing your party theme way in advance. Knowing I would be hosting a spring themed birthday party, I purchased these butterfly nets for party favours at the end of the previous summer when they were on sale. You just need storage space if you intend to shop early! 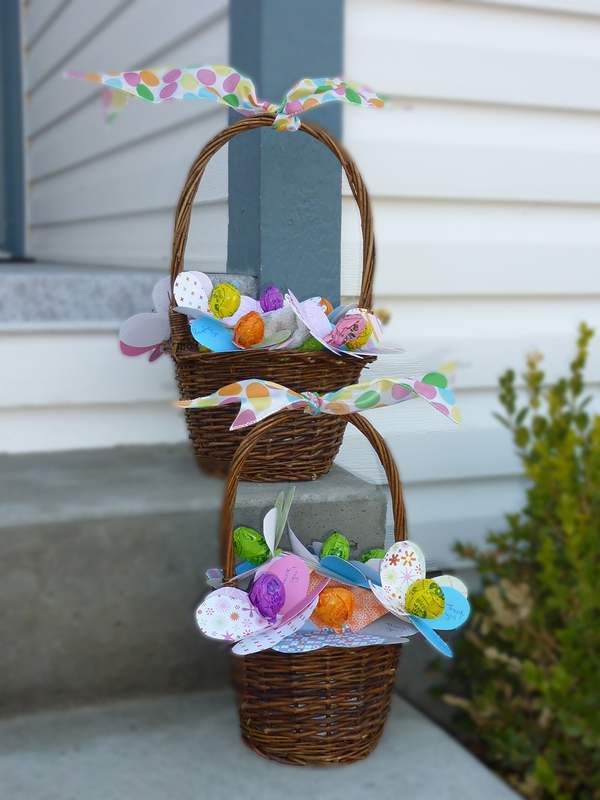 My entryway is not large, so I decided to put all favours outside for the guests to take as they left the party. It worked out well as it cut down on the congestion inside the front door. Nothing fancy about the cake recipe I used. Simple boxed cake mix. The icing is colored using Wilton color gels, which provide great color without watering down your icing like with liquid food coloring. Arranged to look like a flower coming out of the dirt, the bottom cupcakes are chocolate with chocolate icing, crushed Oreo crumbs and gummy worms. 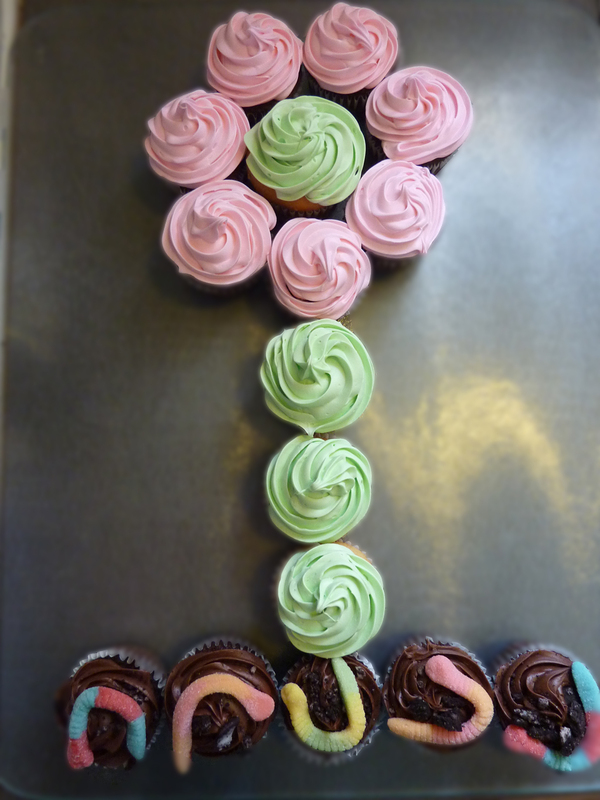 Kids love cupcakes and they are easy to serve.